The artist; sale, Htel Drouot, Paris, 14 February 1881, lot 3. The Witt Library of the Courtauld Institute of Art, London. Richard Green Gallery, Ltd., London. Acquired from the above by the present owner in 1990. J. Couper, Stanislas Lpine, 1835-1892, sa vie et son oeuvre, Paris, 1969, no. 32 (illustrated). R. and M. Schmit, Stanislas Lpine, 1835-1892, Catalogue raisonn de l'oeuvre peint, Paris, 1993, p. 45, no. 108 (illustrated). Paris, Salon des artistes franais, 1879, no. 1900. "Consciously so or not... renderings of the bridges are symptomatic of the mood of post-war reconstruction and the rebuilding of France's pride. Pissarro and Sisley, in the same years, painted bridges and commercial activity along the waterways near Paris, as did their contemporaries Hervier, Lpine and Guillaumin. Taken together, these paintings interpret a mood of secular optimism that has had little counterpart before 1870" (R.L. Herbert, Impressionism: Art, Leisure and Parisian Society, New Haven, 1988, p. 220). In Le Quai de Louviers au Pont Sully, Lpine details the skyline of the city: Notre-Dame on the Ile de la Cit in the center background, Ile Saint-Louis to the right, Sully bridge in the center midground, and the Jardin des Plantes and the Quai Saint-Bernard across the river Seine on the left of the composition. The preface to Lpine's exhibition at Galerie Durand-Ruel in 1892 praised Lpine's work as being "...distinguished for its life, movement, and luminosity which renders it with incomparable charm and delicacy, with a touch so completely original that it is apparent that it is his work" (quoted in R. and M. Schmit, op. cit., p. xxv). Lpine's poetic compositions show the influence of his master, Jean-Baptiste-Camille Corot, who had recognized his talent early on and duly encouraged him. At the time of Lpine's death in 1892, Georges Lecomte called Lpine "the direct student of the divine Corot, the sole legitimate inheritor of his manner" (quoted in ibid., p. xxiii). 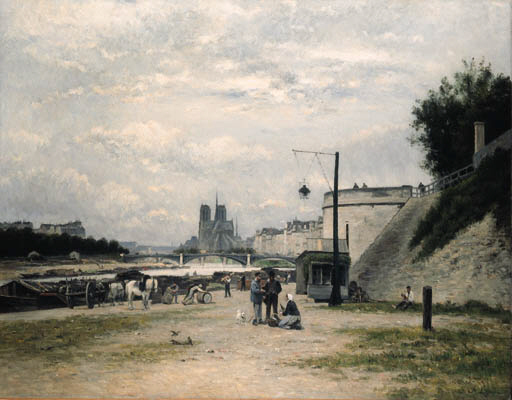 In 1881, Le Quai de Louviers au Pont Sully was sold at Htel Drouot in a sale of Fifty-three paintings by Lpine of Paris and its environs. "For a living artist to sell his work at the Htel Drouot was not unheard of; many resorted to it regularly, thereby supplementing their direct sales to dealers and collectors... [and] the impressionists owed much of their success to that establishment" (A. Distel, Impressionism: The First Collectors, New York, 1989, pp. 53-55). Indeed, Lpine had been selling his paintings directly through Htel Drouot since 1874 when he first auctioned thirty-two works; however the auction in 1881 was his largest, comprised of "notably two views of Montmartre, four views of canals, ten views of the Seine, four views of the garden of Luxembourg, four views of the Trocadro, four of Cluny and other views of the Seine, Saint-Denis, Saint-Ouen, of Rouen, Andrsy, Donflans, of the Oise, of Carrires Saint-Denis, of Maurecourt and of Briche" (ibid., p. xxi). The painting is also recorded as being with the Parisian dealer "Pre Martin" who had helped to organize the first Impressionist exhibition. Martin also represented Boudin, Corot, Daubigny, Pissarro and Jongkind, and he counted the collectors Count Doria, Henri Rouart, Alfred Sensier and Jean Dollfus among his most important clients.